For some reason we hadn’t had a games evening for quite a while – this is why the general mood was especially friendly. In fact, we never had a games evening with so little bickering and quarreling in a long time. Might it have been the bottles of wine that Walter and Aaron freely distributed (it was a belated celebration of Aaron’s xxth birthday – I’m not allowed to say, which...[Did I say that? Looking at Marcus Barnick's "Who's Who" website my age appears to be public knowledge! Aaron])? 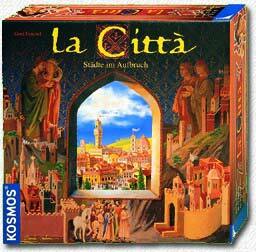 We decided to play “La Città” – Walter had been given this game as a present, and had apparently completely forgotten that we had already played this game ages ago, when it was newly published. Back then the game hadn’t impressed us greatly, but this time we really had to admit that this is a great game (which shows, that the good game reviewer “always has to play twice”). Kosmos published this game as a planned successor to “Siedler” – it is a lush edition, with absolutely fabulous game material, even for German standards. It probably wasn’t the big commercial success they hoped for, but this is a “gamer’s game”, like “Puerto Rico”, a treat for addicts like us. The huge map depicts an empty Tuscany landscape, that players hope to fill with prosperous cities. Certain landmarks are placed on the map before play (the setup described in the rules gives each player about the same starting position, and is highly recommended for the first games). There are “farming” (adjacent cities and farms get food markers, they range from “1” food to “3” food – a city/farm can touch a maximum of two of these tiles and earn the sum of the tiles they touch), “water” (give the possibility to build the all-important “fountain” tiles that hugely increase population capacity) and “mountain” tiles (each mine touching them gives money, it is very important that you build them early, like in “Puerto Rico”). Players start with two cities each, hoping to expand them and to achieve a huge population. For this it is important to know the “will of the people” – people are interested in 3 traits: “culture”, “education” and “hygiene”, each symbolized through a colour. Each round 4 “will of the people” cards are drawn: one open, the other three are secret. At the end of the round the dominating colour will be found out by looking at the hidden cards (in case of a draw, both traits are “prominent” and the players can choose which one to activate with each of their cities). Now all cities within a certain distance (2 hexes) of each other will compete for the extremely fickle and easily bored population. If the neighbouring has city more cultural buildings than you, and culture is “in” at the moment, it will draw away one population figure (which look suspiciously like hobbits, by the way). You usually want as many people in your city as people – first they bring points at the end of the game, second city expansion tiles need people to work- if they have no people on them, they are “torn down” – the city shrinks! But there is also a drawback: people need to be fed, and if you have more people than food markers (described above) the game system will punish you heavily with having you miss out a turn next round, and also reducing your victory score in the final round severely. Peter, who has played this game more often than us, had warned as about this fact, and we all played very carefully in this respect, but still people starved, as the board and the expanding neighbours limit your access to food tiles severely. A round consists of 5 actions – you have 3 cards that you can always play, they allow you to build basic buildings, get gold or start new cities. If you want to build the larger coloured buildings (that give you more of an edge in the populace competition) you need money and the abundant “open” row of action cards, that is constantly renewed from the deck. This means you can have a maximum of 3 “self-decided actions” , the other actions come from the deck – with a selection. Some of these cards have other functions – they give you free extra food for the round, or strengthen your “traits” for the competition. The most important card is certainly the one that allows you to predict to or more of the hidden cards “will of the people” – played early this will give you an edge in planning your turn! Cities are limited to 5 citizens and therefore tiles. A “market place” gives you one “gift” citizen and the possibility to reach the populace of 8, a “fountain” removes even this limit (this is why the water spaces are extremely important – the winner needs two large cities, possibly more, no doubt about that). Each round ends with the mutual removal of citizens from the cities, then you check if you can actually nourish them. The game rewards good planning – If you pump up the traits of the cities (the symbols for these traits look suspiciously like “McDonalds”-M’s, by the way :-), you might get a larger population than you hoped for – starving is bad news, as you lose an action next turn. You also want diverse cities – cities with all traits present get bonus points. It is also a good idea to build last ditch cities in the final round (although there is very little room on the board for additional cities) – each citizen gives you one victory point – and new cities come with 3 “free” citizens! Turns are quick as the decisions are limited but important, very similar to Puerto Rico. Watching the board and planning your expansion is strategically very demanding – when will you cross the safe border of 2 hexes to other cities by building new buildings? Can you be sure to beat them in traits this round? If not you might lose more than you get. Cities can actually be completely destroyed by draining them of all cities, so beware! If you have farming land close by you should build as many farms as possible, they come in very handy for the end game, when you suddenly build new cities to garner VP’s. The same is to be said for mines – the good buildings can be very expensive, and money is very rare. A tactic that usually works is to have a “money city” and a “farming” city, both with different goals. All in all this is a very nice game – not too complicated, but with lots of nail-biting decisions to make. Although it is – like “Princes of Florence” and “Puerto Rico” essentially a solitaire game played by a group, the competition between the cities is THE all-important element of the game. The board is small, and the competition is not sleeping. The game time is longer than the usual German game, I would say around 3 hours for newbies. Thumbs up to “La città”! After a “perfect” victory in “La Città” my strange lucky streak didn’t stop – the two “Bluff” games we played were won with almost no problem, the dice rolled where they should, and twice I beat Walter with extremely lucky rolls that he just couldn’t believe. That this was a lucky streak was proven 2 days later at the “Spuiratzn” – I lost every game, and always came last!